Description: Evolution led coal train heads back to west with emptys. Description: Waiting at Main Street, 0730 hours. Description: Lead engines are through the crossing and entering yard at Marion. Description: These BNSF units caught my eye. They were on a stopped coal train that was heading south. Too bad I couldn't get the number off of the KCS unit. Description: From behind the clutter she appears on an overcast and dark early spring day. Description: Busy day in Bucklin, this is where Burlington Northerns Brookfield Sub crossed under Santa Fe's Marceline Sub. Of course now both lines are owned by BNSF, anyway a eastbound freight meets a westbound coal empty as a westbound hot Z train passes by overhead. Now if that Z train could of been like 60 seconds earlier then I could of had a perfect over and under shot. Better luck next time. Description: BNSF 5765, BNSF 9619, & BNSF 5721 lead BNSF UBISLJ-16 waiting for MCHPB and H-GALMEM at Joan Siding. Description: BNSF 5765, BNSF 9619, & BNSF 5721 lead BNSF UBISLJ-16 waiting for MCHPB & H-GALMEM at Joan Siding. 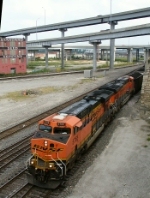 Description: BNSF UBISLJ-16 heads out of the siding at Joan. Description: BNSF 6999, BNSF 5765, IC 1010, BNSF 5658, & MVPX 3811 sit in the Old Monroe siding waiting for a crew to arrive. Description: A loaded oil train headed for the Tesoro refinery on March's Point crosses the Swinomish Channel swing bridge. Description: A loaded oil train headed for the Tesoro refinery on March's Point passes the former location of Whitmarsh Junction. 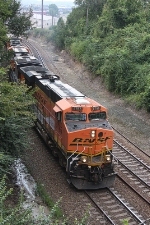 Description: BNSF 5765 sits in the W. Alton siding in the lead of this SLC coal train on the BNSF Hannibal Sub. Description: Bread for Boston - loaded grain train destined for New England Milling in Ayer, MA The run-through power lends a touch of color to an otherwise austere early Springscape.